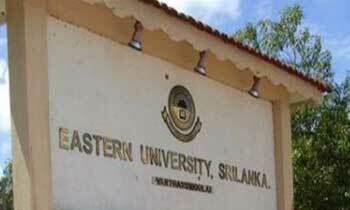 Vantharumoolai and Batticaloa campuses of the Eastern University had been closed indefinitely from today due to an unsettled condition prevailing at the University, Deputy Vice Chancellor Dr. K. E. Karunakaran said. All students had been asked by the University to leave the campus by noon tomorrow. The students in all hostels were asked to vacate their rooms and handover their keys to the respective wardens or sub-wardens on departure. A tense situation prevailed at the Eastern University on August 8 when a large group of students surrounded the university’s Senate House and held its Vice Chancellor captive. According to the Eravur Police some 200, second year students surrounded Senate House. They behaved like rowdies even in the '60s. Damaging the VC's Lodge and burning his library is an example. All these rowdy students were brain washed by Marxist ideology.